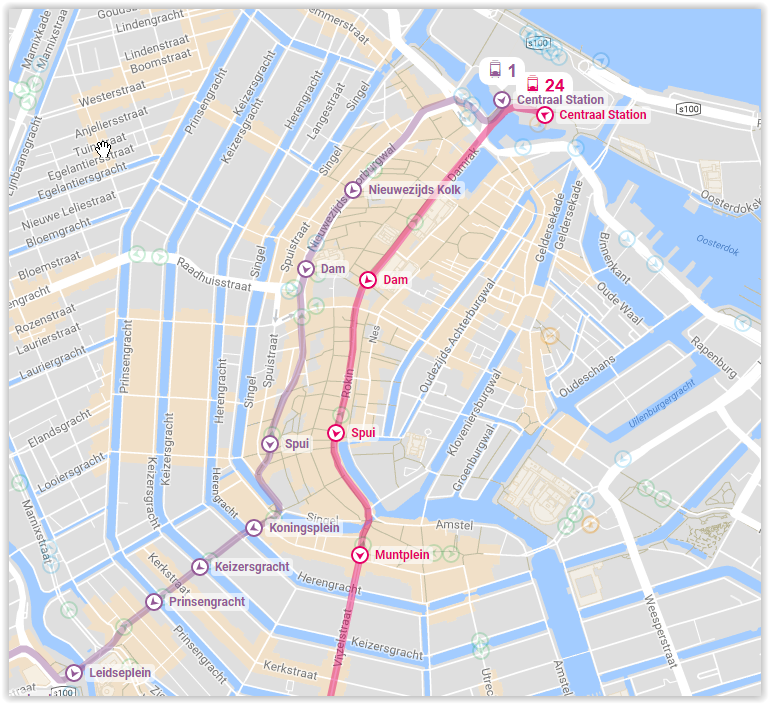 The Best Amsterdam Tram Map is an attempt to simplify the Amsterdam Transport Map into something actually usable by a tourist in Amsterdam. The secret is that you don’t have to remember all the trams, trains and buses in Amsterdam. You only have to remember five Trams. Combined with the Best Amsterdam Tram Map, you can see almost any site in Amsterdam by using only 5 trams. 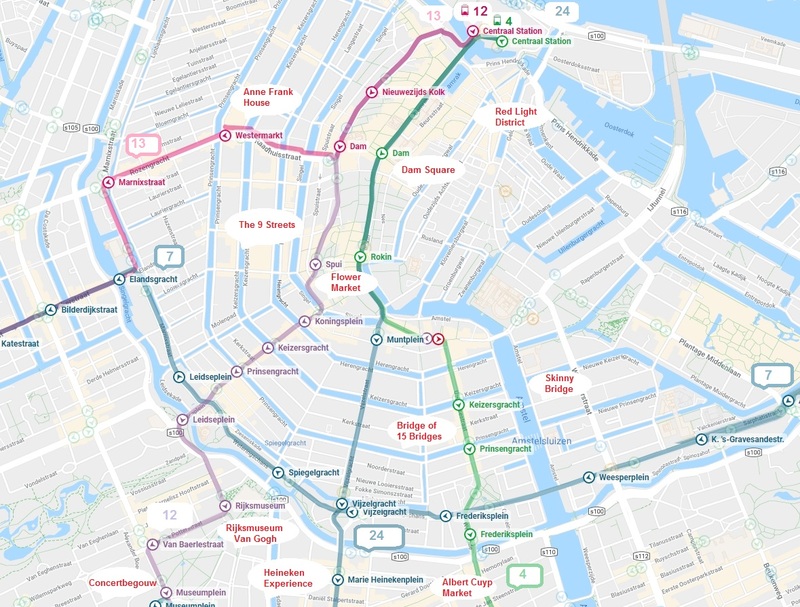 By saying the best five trams in Amsterdam, that isn’t to imply that they are the most traveled, go the most places, or contain the least amount of smelly tourists. The best five trams in Amsterdam are the best if they are used together to get from place to place easily and with few tram changes. First let’s discuss the stations that will be used as interchanges on the map. Dam – Use this station to walk to see Dam Square or to walk to Red Light District. There are two sets of Dam Stations. See Map Below. Spui Station – Use this Spui station to transfer between Tram 24 and Tram 4. There are two sets of Spui Stations. See Map Above. 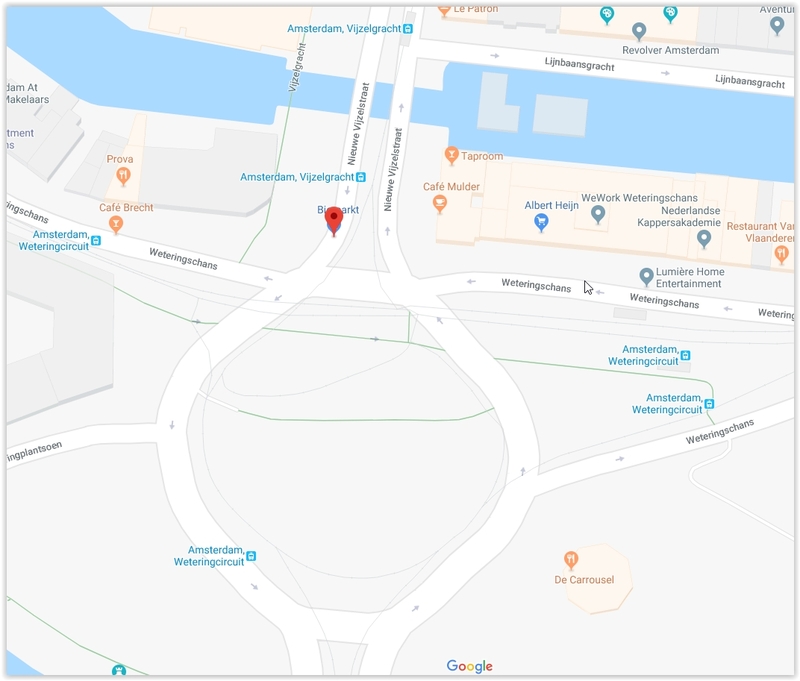 Weteringcircuit & Vijzelgracht – You need to walk about 100m between these two stations to Transfer between Tram 24 at Vijzelgracht & Tram 7 at Weteringcircuit. It is literally like walking around the corner but they are two different stops with different names that serve different trams. See Map Below. Tram 4 – Tram 4 runs straight through the middle of Amsterdam. It hits Dam, Spui, & Albert Cuyp Market from the east end. Tram 4 goes a bit further east than Tram 24, but both trams follow the same route until Spui. Tram 7 – This Tram runs along the outside of the outer canal ring. It is the easy way to go from Albert Cuyp Market all the way over to near Anne Frank Huis. A simple change at Marnixstraat allows connection to Tram 13 which serves Anne Frank House. Tram 17 also run to Anne Frank Huis and then to Centraal. Tram 12 – This tram will run from Amsterdam Centraal Station, to Dam & Spui, and then runs out to the Rijksmuseum and Concertgebouw. You can transfer at Dam to Tram 14 to Anne Frank Huis. Tram 13 – This Tram serves Anne Frank Huis from Centraal Station. Not many other sites are served by Tram 13 but if you want to see Anne Frank Huis or WestKerk by tram, the only choices are Tram 13 and Tram 17. Tram 24 – Tram 24 runs straight through the middle of Amsterdam. It hits Dam, Spui, the Heineken Factory & Albert Cuyp Market. Switch at Spui for Tram 14 and you can see almost every major site using just two trams.